Enjoy the classic broodwar game with improved mechanics, new units, upgrades, abilities, and lot of changes that will improve the gameplay and open new strategies and compositions to fight with. Post news Report RSS	1.5 Version is Out! This new version brings a lot of new visual effect, reworked upgrades, some new abilities and improved game mechanics. There are also lots of balance changes and of bugs fixed. Now the Sentry is a spell caster and its focused on support ground armies. The new Sentry has the Plasma Surge spell that allows to instantly recharge ground allied shields. It also has a reworked version of seismic shockwave that can slow ground units, making it useful to hold a choke point, or difficult an enemy retreat. But this ability also affects your own units, so its works better with support of ranged units. It still disables Tanks, and Spider Mines, and now it unburrow any burrowed units, so it will help against Lurkers. Medics have increased cost and the healing rate its lower, but they can heal from a further distance so they can be safer from splash weapons. Also they healing capabilities can be improved with the new Stabilizer Med-packs upgrade. Science Facility has been lowered in the tech tree and only requires a Factory. So you can have access to infantry upgrades and unlock Ghost earlier. Vehicle and ship upgrades now require a fusion core to unlock the higher levels. It can be used to snipe key units like before, but also can be used to harass worker lines, or deal damage to groups of clumped units, it synergy well with Ensnare. 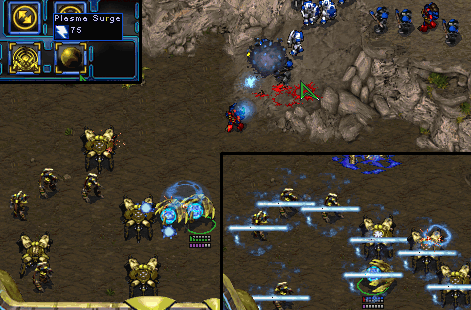 The new Nydus Canal doesn't need creep to place the exit, so it can be used to infiltrate behind the enemy lines. The Improved Mitosis upgrade makes it a lot better as it reduce its morph time. There is a lot of stuff that I haven't the time to add yet, so this release doesn't have new units, some spells where temporary removed and some units are still incomplete and will be reworked for future versions. As I wont be able to work for a while, I decided to release a more complete and solid version than the last one (and hopefully with less bugs). Wow nice! Didn't expect to see a new SC1 mod release anymore :D Will test first thing tomorrow. SC1 modding community has growth a lot since SC2 come out, lot of new resources are available, and more important, the modding tools where updated and improved on the last year. Wooo! :D When I first saw this in my updates, I just sat here jumping up and down in my seat like an idiot saying: yayayayayayayayayayayayayayay. :D Before I even saw any of the changes. xD I love this mod. cool, now it's time for AWESOMENESS! RavenWolf, even though you still didn't manage to add everything you wanted this is still a great improvement for the last version, I never stopped loving your mod. And with the new graphics and changes I hope it will feel more fun to play. Yup, no Diamondsbacks for now. Felicitaciones RavenWolf, se ve bastante bien la nueva version de tu mod, buen trabajo. Im not aiming on make a SC2 mod, but im including stuff and units that will improve the gameplay. Also, there are some proyects atempting to make a SC2 mod. You probably have the first release of this version, that bug is fixed in the current release, you should dowload the file again that have some bugs fixed. Also a new update will be uploaded in some days fixing other bugs.